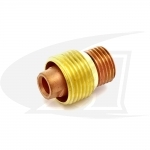 The heavy-duty "nose" collet body threads directly into the front of the torch body enhancing cooling capacity of the torches front end parts, and extends arc on time. Optional gas lens collet bodies are available to improve gas coverage for the most demanding jobs. The WP-12 uses tungsten electrodes in sizes up-to-1/4" (6.4mm) for high amp continuous AC TIG welding. 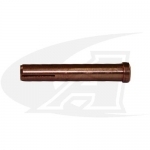 Collet Body, 1/16" - 1/4"